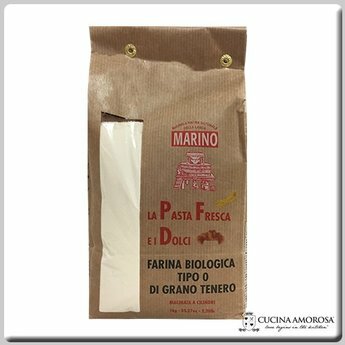 Mulino Marino grind soft wheat, with both the cylinder and stone mill, to obtain 0 e 00 flour. The concept Mulino Marino employs with their cylinder milling procedures is similar to that used for the stone mill. Mulino Marino rarely grinds their cereals a second time and aim to reduce the milling processes to a minimum – thus avoiding overheating of the flour All our flour is milled in pureness and contains no additional additives (milk and its derivatives, vitamins, preservatives, malt and its derivatives, etc). Natural stone is used for grinding cereals, according to the characteristics of each single cereal. The cereals are left unrefined o sieved, thus maintaining unaltered their nutritive principles. Being a family-run business, and thanks to the expertise gained during the periodic hammering of the stones, as well as constantly following all the different phases of transformation, allows us to choose the best to obtain the best. Only one procedure is necessary to obtain flour by means of stone milling, and consequently without heating it, allowing the germ to be present in the flour. The flour produced has a more intense aroma and is more nourishing and more easily digestible. We grind soft wheat, with both the cylinder and stone mill, to obtain 0 e 00 flour. Our mill is equipped with a laboratory in order to carry out rheologic tests and N.I.R machinery to evaluate the quality of the cereals before purchasing them, enabling us to select only the best. FOOD SAFETY All the raw material as well as in flour are analyzed for: - 218 pesticides (herbicides, insecticides, fungicides) used on grains and flour in the field or in stock - Chemical growth Plant Growth Regulators (Chlormequat, Mepiquat) that are in the field data to improve plant growth. - Phosphine (pesticide insecticide) - Glyphosate (herbicide pesticide) - Class of mycotoxins (aflatoxins, DON.) - Levels of microbiological contamination.